It was the spring of 1992 and I felt I had the world at my feet. I was young, healthy and happy with a beautiful 4 your-old daughter, a thriving new business and a new love interest named Chris. Unfortunately my joy did not last. In the months that followed, my life fell apart from one tragic loss after another. I won’t go into detail here but suffice it to say it was a most difficult time. My love relationship, which I had expected to be a source of comfort only added to the pain. After a great start, it spiraled down into a seemingly endless battle for power and control. Though we both wanted to end it, our passion for each other kept us from walking away. Through it all, I kept going. I was unwilling to stop and grieve the losses. After all, I had a child to raise and a business to run. I had no time for a pity party. Being the survivor type, I was determined to put the pain behind me and find my way out of my difficulties. I worked for nine months, putting forth tremendous effort. I turned to my religious roots for help with the emotional pain, I turned to therapists for help with Chris and though each was useful, it wasn’t enough. By April of 1993, I was a total wreck both emotionally and physically. The unremitting stress had left me with a serious case of Epstein Barr and Fibromyalgia. Sick and chronically tired, I felt knocked to me knees. The final blow had come in the form of an eviction notice. The notice was my landlord’s answer to my request for new carpet after my apartment had been flooded. Sitting in the dark that same night, alone and frightened, I turned to God for help. For those of you who have always believed in God, praying might not seem like such a big deal, but it was for me. I had not prayed in years and had given up on both God and prayer in my efforts to free myself from the religion of my youth. But with no one and nowhere else to turn, I had decided to give God another try. Though I am aware that God is defined in many ways, including Goddess, Source and All that Is, for brevity’s sake, I will use the term God in the masculine gender from this point forward. I prayed, asking God to send someone to help me. I held on to the hope that he was truly all forgiving and so would acknowledge my plea even though I had ignored him for years. To my great surprise and relief, he answered. A few nights later a spiritual master named Devin appeared in my dreams informing me that he had come to help. From that night forward my life began changing. With Devin’s assistance I began finally began to work out the current issues in my relationship with Chris but to do it, I had to rethink many of my beliefs. Among others, I had to learn how to think and act as a Creator being instead of a victim. In time, I came to call this higher level of awareness “God Consciousness”. My tumultuous relationship with Chris ended the following year but only after I could walk away with appreciation and gratitude for the role he had played and lessons he had unknowingly taught. Shortly after, Devin taught me something my heart had long desired: the ability to heal emotional pain through the use of a higher form of compassion. This was a real eye-opener because I discovered that the compassion that I had shown to others was not healing at all. In fact, it was nothing more than pity. On the other hand, the higher level of compassion Devin had revealed fostered emotional, mental and physical healing at a depth that I had never known. It was the culmination of all that I had learned to that point. I recall how, after the first time that I applied this new type of compassion to clearing a painful issue, how much lighter and freer I felt. That experience was enough to convince me that I had been given a very precious gift. In fact, it was a gift so precious and rare that I could not in all fairness keep it to myself. It must be shared. With Devin’s help, I developed the elements of higher dimensional compassion into a 9-step process. 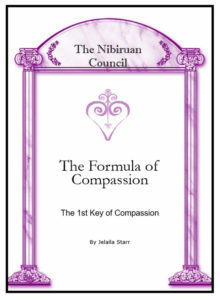 I named this process the Formula of Compassion (Formula). It is with great pleasure that I present this amazing tool. May it heal your relationships and restore you to wholeness so that you can live and love like never before.